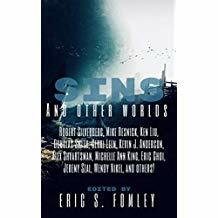 Sins and Other Worlds is a dark Science Fiction short story anthology comprised of reprint stories from 30 talented authors. The stories range from deep space, alien planets, alternate realities and beyond. Most stories within are flash fiction interspersed with several longer works from both emerging authors and titans in the field. The anthology collects some of the best dark sci-fi in recent memory. Includes my story God State (1,299 words) Originally published in Daily Science Fiction. When you get to a certain age, conversations with your mates often turn into a nostalgia-fest about The Good Old Days. Is the past better than the present? Maybe. Maybe not. On the way out of the gig, I stop at the merchandise stall to get a t-shirt. I find one in my size and pull out my wallet, then hesitate. It looks good quality, but the colour — almost exactly the same blue as a scanner booth — puts me off. I read somewhere they call that shade ‘Spectral Indigo,’ and ever since then it’s given me a slight case of the creeps. On the way out of the gig, I stop at the merchandise stall to get a t-shirt. I find one in my size and pull out my wallet, then hesitate. It looks good quality, but the colour — almost exactly the same blue as a scanner booth — puts me off. I read somewhere they call that shade ‘Spectral Indigo,’ and ever since then it’s given me a slight case of the creeps. Read the rest in Sins and Other Worlds, available in ebook now.